When I get home from work, I usually fix dinner and sit down to watch a half hour or so of something online. I generally shoot for something that I'm hoping to get some broader cultural awareness of/for, rather than whatever I happen to find. That's not to say I go all high-brow, just that I make my choices very consciously based on something I'm trying to understand, even if that's just some niche part of pop culture. A couple years ago, I went through Blake's 7, not because I particularly liked it (I didn't) but I've read enough about it in talks about science fiction fans that I felt it necessary to watch through them to gain a better understanding of what they were talking about. Lately, I've been mostly alternating between Return to the Planet of the Apes and Fantastic Four: World's Greatest Heroes. 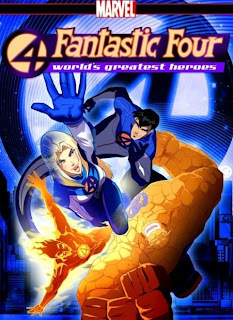 The FF cartoon was intended to be a modern, updated version of the team, strongly influenced by anime; though it came out not long after the live action movie, there's no real connection to it other than the base premise. Return to POTA was the last attempt to tap into the original POTA popularity in the early- to mid-1970s by way of an as-cheap-as-you-can-make-it Saturday morning cartoon. I vaguely recall watching the first couple of FF episodes when they came out, and quickly turned it off, thinking they did a terrible job with it. I've returned to it now, because it occurred to me that I was perhaps TOO invested in the characters at the time, and I may have been unduly harsh on the show because of it. But looking at it now, I will say that I don't think my original judgement was misplaced. The new character designs are okay, and the combination of computer and traditional animation looks a bit dated but it's understandable. The animation is decent for the type of show that it was. But the characters -- every one of them -- feels completely hollow. It's taken me a while to figure out why, but it boils down to the writers giving each character a single, defining trait. And that's it. There is no depth to any of the characters at all. I thought perhaps it was the actors reading poorly, and coming across as flat, but as I continued watching, I realized that they had almost nothing to work with. There is no reason for me to care about these characters, because there's no way I can get to know them. There's nothing TO know. And what really struck me is watching this in direct comparison to Return to POTA. The show was produced by DePatie-Freleng (with designs by Doug Wildey) and they did quite a bit to cut costs on the show. There were a lot of long pans across static landscapes, repeated reuse of animations, and little movement of the animations that were present. Consequently, the show was sometimes a bit slow and ponderous. Despite that, however, it still proved to be more engaging than The Fantastic Four because the characters all had depth to them. Not a lot -- there were only thirteen 25 minute episodes -- but they often faced moral quandaries and internal conflicts that needed to be resolved in some manner. Which meant that, despite the slow pace and more cost-conscious animation, Return to POTA winds up being a more enjoyable show than one with more action, a quicker pace and characters I have a deeper history with. My point is characterization is really important. You can do stories which may not have the best production values, but if they lack character, if your audience doesn't feel like they're getting "real" people, you're going to wind up with a pile of drek that even die-hard fans won't like. When the FF cartoon first aired, it got yanked after only eight episodes. When it came back the following year, it got yanked again after nine episodes. The remaining nine episodes (which had already been completed) weren't shown. No explanation was ever given, but I think it's safe to assume that everyone recognized that the final product simply wasn't very good. And even if they couldn't pinpoint why, they inherently knew that a lack of depth, a lack of character, made the show more flat than the still lifes in Return to POTA even though World's Greatest Heroes used a 3-D modeled New York as its backdrop.